Paige introduces the returning Becky Lynch. Lynch joins Paige in the ring. Lynch says when you are the hottest thing in the industry any time away is too long. Lynch says she was held back from fighting at Survivor Series but no more. Lynch, “The Man”, is putting herself back in the game. Lynch asks Charlotte Flair to join her in the ring. Flair obliges. Lynch says she told Flair to give Ronda Rousey the beating Lynch would have. Flair got close. Lynch tells Flair that had to channel Lynch to come close to beating Rousey. Flair said she isn’t Lynch, she is a Flair. Flair is genetically superior and will do anything possible to win. Lynch says Flair went from pretending to be her old man, to pretending to be the man. Flair says she fought for herself, not Lynch. They will fight again. Flair says she wants to fight now. Paige tells them to stop. Paige books Lynch vs Flair at TLC for the Smackdown Women’s championship in a TLC match. Mandy Rose. Sonya Deville. 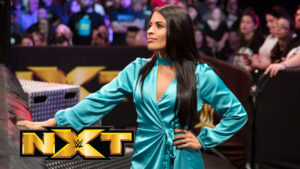 Zelina Vega and the IIconics complain about Paige only giving opportunities to her old Team PCB teammates. Naomi, Asuka, Lana, and Carmella walk out on the stage. Naomi says she actually agrees with Rose. Paige books a battle royal for tonight. The winner will be added to the women’s title match at TLC. Deville sends Lana out of the ring under the bottom rope, not over the top. Deville sends Vega over the top out to the apron. Lana pulls Vega off the apron. Lana laughs at Vega. Vega attacks Lana outside the ring. The IIconics toss Lana over the top rope. Auska destroys both IIconics. Asuka hip attacks both IIconis off the apron. Carmella kicks Asuka in the head. Asuka sends Carmella out to the apron. Asuka kicks Carmella in the gut, knocking her off the apron. Deville and Rose double team Asuka. Rose blast Asuka with a running knee. After a bit of back and forth, Rose misses a running knee and eats the ring post out on the apron. Rose falls to the outside. Deville double legs Asuka. Rose tries to pull Asuka off the apron. Asuka knees Rose in the face. Asuka and Deville fight on the apron. Asuka hits the pop-up knee and Deville is sent flying to the outside.